Witamy! 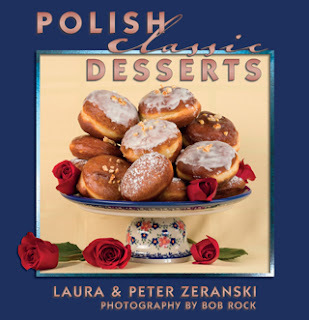 We haven’t been cooking a lot of traditional Polish food lately. We’ve been grilling almost every day to avoid heating up the kitchen with pots and pans. Plus it’s healthier. And we’ve been eating more fish that someone said is “brain food” – I can use that! Salmon is plentiful and does really well on the grill, especially if the filets are thicker than half an inch. I like to baste our salmon in a 50:50 mix of melted butter (or canola oil), lemon juice, and with a tablespoon or two of fresh chopped dill whisked in (dill being the honorary national herb of Polish cuisine)! Thinner filets can be poached on the stovetop in less than 10 minutes...add a quarter cup of dry white wine to the butter/lemon/dill mix. Grill (or simmer) the salmon until just barely done, then serve with sliced tomato over which you have sprinkled more fresh dill. Almost every cuisine has preparations for salmon. It’s mostly a matter of changing up the herbs and other flavorings. So here is another way to serve salmon in a uniquely Polish style that works well for a light supper on a hot sunny day. And it’s guaranteed to make any Polish Bacia (Gramma) or Dziadzius (Grandpa) smile. Precook the salmon by placing the salmon steaks, celery, onion and parsnip in a flat pan. Cover with boiling water, season with salt, and simmer about 15 minutes, or until just under done. Let stand in the water until the fish cools to room temperature. You can make this a day ahead, but seal and refrigerate the fish overnight. Bring it out early enough for the salmon to warm up to room temperature - about 45 minutes. Place the fish steaks on a long serving platter. Lightly dress with a little “smear” of mayonnaise across the top of the steaks. Sprinkle with chopped egg and then sprinkle with dill. Arrange the cucumber slices on one side of the fish and sprinkle with dill. Arrange the beet slices on the other side of the fish. Lightly sprinkle the whole platter with lemon juice just before serving. Pair with a very dry white wine if desired. Smacznego!